Fitzsimons Army Hospital — known as Fitzsimons Army Medical Center (FAMC) from 1974 — was a U.S. Army facility located on 577 acres (234 ha) in Aurora, Colorado, USA. The facility opened in 1918 and closed in 1999; the grounds are currently [update] being redeveloped for civilian use as the Anschutz Medical Campus and the Fitzsimons Life Science District. Professional football player Wendell Hayes visits patients during the Vietnam War. The facility was used heavily during World War II to treat returning casualties and became one of the Army's premier medical training centers. In the 1950s, Dwight Eisenhower received treatment at the facility three separate times for his heart condition while he was president. In September 1955, while on vacation at his in-laws' house in Denver, he suffered a myocardial infarction and was placed in an oxygen tent at the facility. In 2000, a suite of rooms on the hospital's eighth floor was restored to appear as it did when Eisenhower was recovering there. Fitzsimons aerial view, circa 1973. Building 500 is at the center of the photo. In July 1995, the Base Realignment and Closure Commission recommended the closure of the facility, with the exception of the Edgar J. McWhethy Army Reserve Center, located at the southeast corner of the installation. The closure was completed in 1999 and the reserve center was relocated to the northeast portion of the site. The projected $5 billion (Economic Contributions of Activities at Fitzsimons Life Science District and the UC Denver Anschutz Medical Campus - Sammons/Dutton LLC, 2008) redevelopment of the facility into civilian use currently includes the construction of the University of Colorado Hospital's $147 million Anschutz Inpatient Pavilion, and the $509-million Children's Hospital. The medical campus also includes University of Colorado Denver medical education and research facilities, including the Ben Nighthorse Campbell Center for Native American Research, named in honor of the U.S. Senator Ben Nighthorse Campbell of Colorado. Additional facilities currently built at the former base include the Bioscience Park Center and Bioscience East (multi-tenant commercial lab buildings in the planned 6,100,000-square-foot (570,000 m2) Colorado Science+Technology Park at Fitzsimons) and 21 Fitzsimons(a residential/retail town center). The future Veterans Affairs Medical Center is still unfinished. 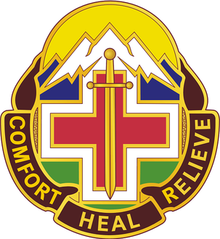 FAMC was the location of the United States Army Medical Equipment and Optical School (USAMEOS). USAMEOS provided technicians trained in Biomedical Equipment Repair or Optical Laboratory Operations. Biomedical equipment repair personnel (referred to as BMETs—pronounced 'bee/mets') were assigned to military medical units to install, maintain, repair, and calibrate sophisticated life support, diagnostic, imaging, and general medical equipment. Military Occupation Specialties (MOS) graduating from USAMEOS included: 35G, 35S, 35T, and 35U. Optical laboratory technicians were designated as 42E upon graduation of the 21-week optical training course. In the hallways of the USAMEOS training facility hung the pictures of graduating BMET classes over decades of operation. When the USAMEOS program was first developed, the training program was divided into Basic and Advanced Courses. The basic course work was 20 weeks long. The advanced course work was 32 weeks long. The courses were later changed to a 40-week basic class (35G) and 32-week advanced course (35U). The graduates of the basic course were known as "Super G's" referring to the MOS of 35G. With a small amount of additional course work, USAMEOS graduates could earn an AAS in Biomedical Equipment Maintenance from Regis University in Denver. During the 1990s, the MOS designation was changed to 91A for Biomedical Equipment Repair Technician, and the Basic Course consisted of a 38-week course broken up into twelve modules. Didactic Modules included Anatomy and Physiology, Basic Soldering, AC/DC theory and Ohm's Law, electron theory, Transistor Theory, Digital Circuits, Basic Troubleshooting, Dental and Pneumatic Devices, heating and cooling, Sterilizers and Ultrasonic Cleaners, Linear Circuits, Spectrophotometers and Solid State Relays, advanced troubleshooting, cryogenics primer, high and low capacity modules of X-ray, The school culminated in a field problem where students lived in ISOs and temper tents while filling out paperwork in the field environment to include pulling guard duty and setup of mobile sterile operating units and generators.. After graduation from the basic course, students would typically be assigned to an operational unit for practical work between the Basic and Advanced Courses. Technical training at USAMEOS was accelerated, 8 hours per day in class, it was intensive and provided both engineering theory and hands on learning opportunities in an extensive set of labs. The school closed in 1999 due to base closure. Former U.S. Secretary of State, former long-time United States Senator, and 2004 presidential nominee John Kerry was born there on December 11, 1943, while his father was receiving treatment for tuberculosis. James E. Bowman was Chief of Pathology at Fitzsimmons during the 1950s. President Dwight D. Eisenhower was hospitalized for several weeks in 1955 due to a heart attack. ^ a b Colfax: Main Street Colorado. 2007. Havey Productions. "Health-Care Owners Seek Cure For Projects". DesignBuild Magazine. Archived from the original on 2003-02-07.